Multi family Development, Utilities established. Zoning could be commercial or residential. When it comes to buying or selling real estate, you want positive results. Whether it is residential, commercial, land or investment property, to each transaction we bring our loyalty, expertise and commitment to excellence. Our goal is to make sure you are satisfied every step of the way. So when you, a friend or family member need assistance you can count on us! Call today! 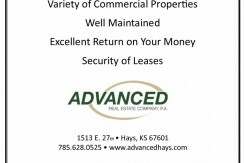 Advanced Real Estate Company with offices in Hays and Norton. 1157 280th can provide you with some country living with room to expand. The large back yard would allow you to have a large playground or provide the area for a swimming pool. The home is located in a quiet neighborhood and access to a blacktop road, again country living at its best. The house has five bedrooms and two bathrooms. The basement has been totally remodeled for a nice fresh look. The main floor has had some new windows put in the last couple of years. Get the latest updates about new land for sale!